Sri Aurobindo Seva Kendra has a NABL accredited Pathology Section and is the first hospital in Kolkata to obtain ISO 9001-2008. It was certified by Bureau Veritas. EEDF (Economic Entrepreneurship Development Foundation) Health Centre was founded in February 1971 by the late Dr. S.C. Dutt, the founder Chairman & Managing Director of the DC group of companies. 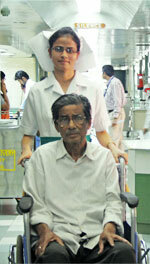 Dr. Dutt was the first one to introduce treatment under one ceiling in Kolkata, West Bengal. His vision was to provide health care services to the middle & lower middle class sections of society and to the employees of DC group at an affordable rate in a comfortable environment. The Health Centre began by rendering services from 3 rented houses in Jodhpur Park and in a mobile medical van where doctors and nurses were present to take care of the patients. In 1991, it moved to a new building and was named ‘Sri Aurobindo Seva Kendra’.